Also download the soundtrack on Bandcamp! Art, Animation, Game Design, Sound Effects: David Thatcher (Giraffe Cat). Music: James Starkey (5 of 6). I'm going fairly conventional with this. Since the last Wizard Jam I've wanted to make an isometric adventure game in the style of Head Over Heels, starring Dot Gobbler. The story will be that of the fat kid on Halloween who made fun of the unimaginative ghost costumes of three older boys, and went on to regret it. Here's a list of features! - Fully 3D, animated Dot Gobbler. - At least, ooh, 5 different rooms. - An inventory system, for storing all of the dots you collect. - Music by my friend, 5 of 6. Mostly I've just been thinking about how to make the game systems, and deciding whether to make the rooms from tiles, or to model them individually. I'm going to try an orthographic isometric projection for the viewpoint, but I might switch to a projective camera if that looks weird. I'm away this weekend, and I'm probably moving house in the next couple of weeks, which is inconvenient, but I'll hopefully be able to make something cool. Low poly model, before I finished the face properly. I was hoping to make a bit more progress today than I did; next thing I need to do is rig the mesh so that I can animate it, and once I've done that, and am sure I don't need to make any more changes to the mesh, I'll UV map and texture it. I'm planning on having the eyes be on a separate material channel, so that I can basically move a pupil sprite around, and maybe have a material for blinking. I still need to add the eyebrows, too, which I figure will be two floating meshes attached to animation bones, so that I can move them around. I'm also going to see if I can rig the mouth so that it'll close convincingly. What use is Dot Gobbler if he can't gobble? Yeah Wizard Jam's getting real now. For whatever reason it's the kneecaps that really make this for me. I would very much like a 3d print of that dot gobbler. Certainly I can post the model here when it's finished, if anyone with a 3D printer is interested in it! I wasn't sure how they'd turn out, but they're gross, and that's good. My friend made a start on the title screen music! https://soundcloud.com/5of6/dot-gobbler-v1 . It really captures the inherent sadness of Dot Gobbler. I'm going to cut back on the scope of the game a little, because I thought about the amount of work that's needed to make adventure game environments, and it made me nervous. 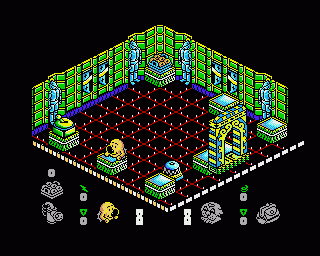 The intention of the game was always that you'd stumble around Dot Gobbler's neighbourhood for a while, avoiding the bigger boys in ghost costumes and solving puzzles, and then eventually shamble into an abandoned LaserQuest. 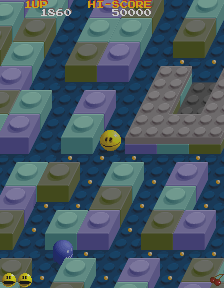 At that point it would turn into a straightforward Pac-Man clone, albeit an isometric one. So instead, I'm going to start with this, and make the game that finally lives up to Dot Gobbler's box art. If I have time afterwards, I'll work on the adventure game stuff, because this is still what I want the game to be. I'm just trying to avoid a situation where the game I submit at the end of the jam is just a really nicely modelled and animated Dot Gobbler moving around untextured environments with no game systems. ... is a lot easier, because it's just a 45 degree camera angle around X and Z. I'll see how it feels. Well at least now when I wake up screaming tonight, I'll know what caused it. God that ambient occlusion. This is viscerally unsettling. Please tell me there's a power-up that causes its eyes to white out like that. Sorry for the nightmares, guys! He'll probably look marginally less horrifying once he has pupils. The power pill will cause Dot Gobbler to enter a drug-induced fugue state where he flails around wildly and is able to defeat ghosts through sheer frantic adrenaline (I'd like to ragdoll the ghosts when this happens, but I've had trouble getting ragdolls to work in the past, so I'll see how that goes). It is very likely that his eyes will roll into the back of his head when this happens. So I'm thinking about Pac-Man mechanics. Because my original intention for this game was to be an adventure game where you walk around at will, when I started thinking about making a Pac-Man clone, that's what I expected the mechanics to be. Pac-Man never works like that, though; he keeps moving in his current direction until he hits a wall, so your inputs are basically just choosing a direction for him to start moving in. I assume the main reason for this is because there's a very specific point at which Pac-Man can 'snap into' a new lane, so to have the player line themselves up perfectly before they can enter a new passage obviously doesn't work. I feel like you can move interpolate them into the right place, though, so maybe I don't need Dot Gobbler to always be moving. I don't know, I'm going to have to think about this. I'm hoping it'll fall into place once I'm prototyping the mechanics. It's not better, is it? If anyone hasn't seen the cover of Dot Gobbler, this is what I was working from. It's totally better. I suspect that I may one day see cosplay of the Dot Gobbler. Synnah I just want to let you know that this is some important work you're doing here. Nailed it, though, maybe you need to allow his pupils and rosey details to occasionally disappear. Does anyone else pronounce "Dot Gobbler" like it's a top level domain? I do. I've had the idea for a few months now to make a wizard jam game about snatching up new TLD domains. The eyes are going to be a material where I can move the pupils around, or swap it out for a blink animation. I hadn't thought about swapping out the rosy cheeks, though. I just figured he would be profusely uncomfortable at all times. I could technically swap out the entire character texture to switch between normal and flushed Gobblers. I became weirdly ill yesterday, so I didn't make any more progress after finishing the texturing. I made a basic run cycle this morning, though! I'm finally going to start setting up the game in UE4; I always sort of prioritise modelling first, but I figured in this case that if I didn't have a realistic Dot Gobbler, why even bother? Regarding the ghosts, I initially thought that having a single solid mesh was the way to go, but I think animating that well would be tricky, getting a sheet mesh to deform realistically. I think what I'm going to do is try and get cloth physics working, and model a rudimentary human shape with a cloth sheet around it. I've never used Apex before, so I'm hoping it won't give me too much trouble. I feel like I need to do this to give Dot Gobbler the AAA polish it deserves.